once i download the latest version i am javing trouble opening it or putting it into action on my router, some help out there for what i do after the download? i mean of course: once i download the latest version i am having trouble opening it or putting it into action on my router, some help out there for what i do after the download? First, extract the bin file from the zip file somewhere on your PC, then go to your router Admin page in your browser, by default it is 192.168.0.1, log in and go to the Tools Menu, then into the Firmware sub-menu. In the Firmware Upgrade section click browse and find/select the bin file you extracted, then click upload, if all goes well your router should have the latest firmware installed. By the way it may reset your configuration, it did for me, so make sure you remember or write down anything specific you have changed from the defaults in the past. Since my upgrade to 1.33 the router is not visible even though I have checked the option making it so. Prior clients still connect but it is not visible to a wireless network inventory. Is there something else I need to be considering? That’s an odd occurrence, mine was visible after the upgrade by default, though as I mentioned previously it did reset my configuration so that might have something to do with it. Perhaps it’s not registering the setting correctly, have you tried resetting the config and then manually re-entering the wireless settings? 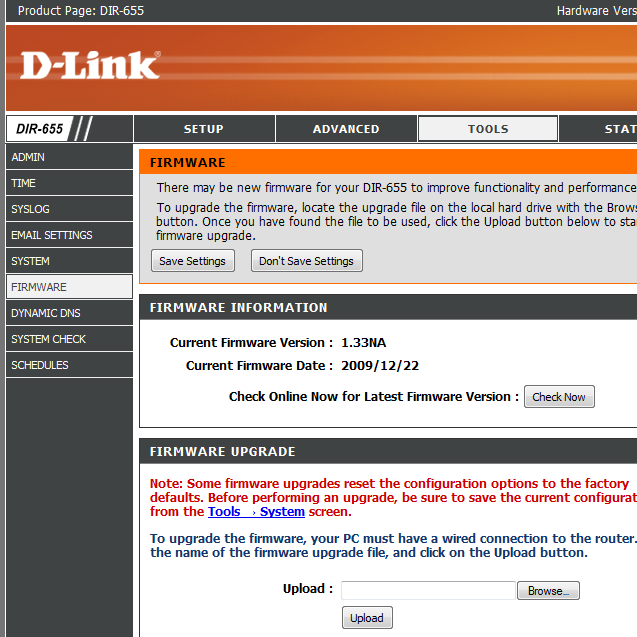 If not, perhaps reinstalling the firmware might help, if that doesn’t work it’s probably best to leave D-Link feedback about it. I wouldn’t worry, it’s down-gradable all the way to 1.30 like the rest. They’ve come out with a non-beta version of 1.33NA. You may want this page for downgrading to pre-1.3x firmware. Iam looking for a firmware to support 3G. My firmware now is 1.21. Need help. 1.21 already supports 3G, I’m using (one of them) at the moment. Have you tried 1.33NA Final from the link at the top of the post? Try upgrading to that instead.